The narrator suffers from a lack of sleep. He tries different ways to cure this, but he does not succeed. He does get some sleep, but his conditions rebounds back into it’s original state when he meets a lovely young woman, whose name is Marla. He finds out that she and he both have a lot in common and they spend a lot of time together. While touring, he meets an enigmatic young man named Tyler and after a short conversation both become fast friends. Both like to relieve their inner tensions by hitting each other. Soon word gets around about their fights, and lots of young people also get interested. 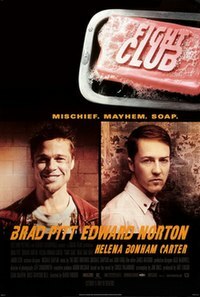 Then a club is formed, which the narrator and Tyler call ‘Fight Club’. Both start spending a lot of time and both also make lots of money. Then one day the narrator finds out that Tyler has been using him.